At a certain point in its corporate life cycle, biotech companies start to consider local deals; that is, licensing their product’s rights in certain geographies to local pharmaceutical companies. The primary reason of doing so is cash. Biotechs are always running lean, and it is almost intentionally kept that way. But time to time, it may need more liquidity for a variety of reasons, and while you do not yet have a product on the market ––– most of the biotechs don’t ––– licensing your product’s right is one of the few ways if not the only way to make money. Two questions may naturally occur; one is about which country to enter, and the other is how much money can they make from carving out a slice of their assets? The two questions have the same root, which is about the size of the market you are trying to sell off. That is, you are essentially trying to give away a part of your product’s future market and monetize it now, and if you let go of too large a market, you will end up with a smaller market to play with, including potential future deals. In other words, you want just enough cash to fuel your corporate activities now without losing too much potential value in the future. So, which market should you go after? 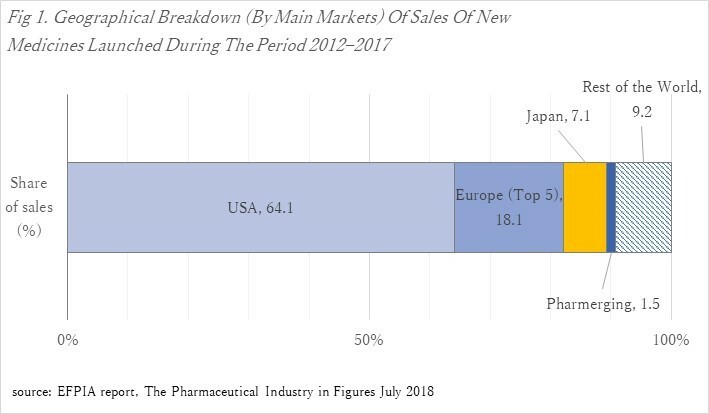 If you want it to be somewhat sizable but not too big, Japan should be one of the markets you consider, as it occupies 7.1% of the global market for new drugs according to the latest EFPIA report. Even if you sell off the rights in Japan, you will still reserve about 93% of the global markets for your innovative product. So then, what is the outlook like when you strike a deal with a Japanese company? The figures do look quite nice. There are about 50 R&D based pharma companies in Japan, based on the data above. On average, more than one deal per company is getting signed annually. 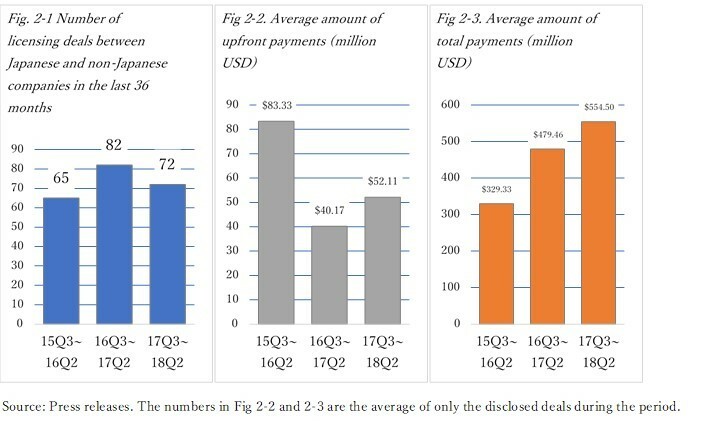 And on average, the amount of upfront payments that the Japanese companies are willing to pay is about 50 million USD, followed up by an estimated 300 to 550 million USD in milestone payments. Also, typically a double-digit percent royalty on sales will be is included in the deals, even after you have collected all the bills. Just by giving up 7% of the global market rights, you can acquire at this level of cash, which is quite lucrative. Such extra cash will likely give the company more strategic options for their products development plans.